Check out our continuing coverage of the March Madness television ratings through Friday. NETWORK FINALS: The CBS NCAA TOURNAMENT games adjusted to 1.7/3.2. All other ratings remained as per the morning preliminaries. 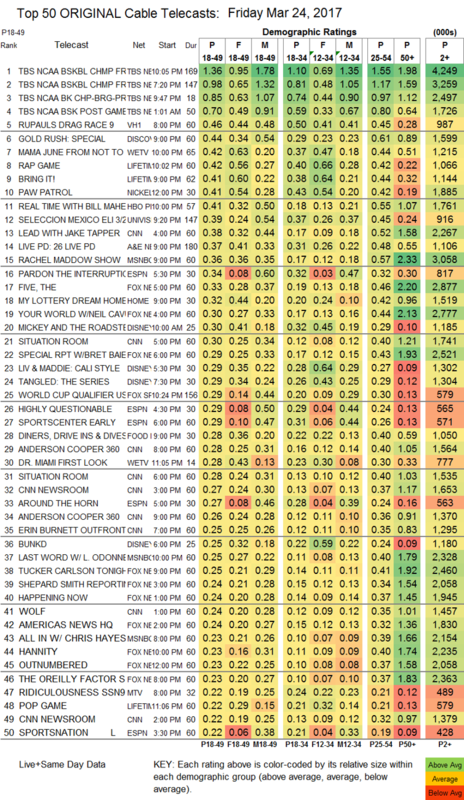 CABLE HIGHLIGHTS: Naturally the TBS NCAA TOURNAMENT games were at the top of cable at 1.36/0.98. The top non-basketball telecast was RUPAUL’S DRAG RACE, which officially relocated from Logo to VH1 and premiered at 0.46. On Discovery, a GOLD RUSH special was at 0.44, down 0.13 from last week’s special. We’s MAMA JUNE FROM NOT TO HOT rose 0.03 to 0.42. On Lifetime, THE RAP GAME held at 0.42, and BRING IT ticked down to 0.41, with THE POP GAME down 0.02 to 0.22 Nickelodeon’s noon PAW PATROL hit the Top 150 at 0.41. On HBO, REAL TIME WITH BILL MAHER returned from a week off at 0.41, and ANIMALS was down 0.01 to 0.07. 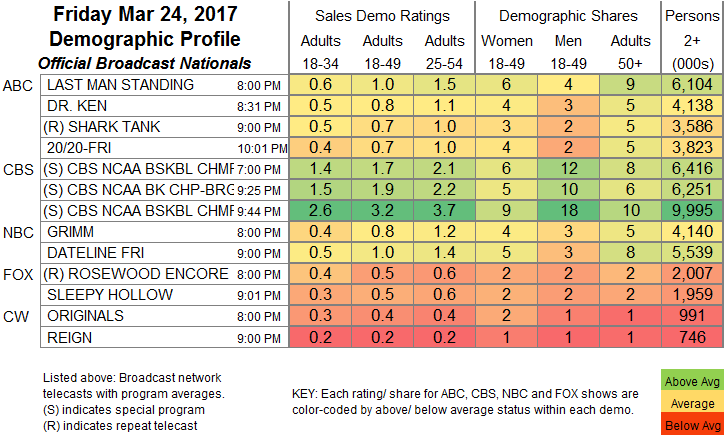 A&E’s LIVE PD was steady at 0.37. On HGTV, MY LOTTERY DREAM HOUSE climbed 0.07 to 0.32. Food Network’s DINERS, DRIVE-INS & DIVES dropped 0.05 to 0.28. MTV’s RIDICULOUSNESS lost a tick to 0.22. On TLC, GHOST BROTHERS added a tick for 0.16, and A HAUNTING remained at 0.15.